Like many other former colonies, the Central African Republic celebrates the day when the state gained independence from the colonizer. In CAR Independence Day is known as Republic Day and it's celebrated on December 1. France took control of the Central African Republic (then it was known as Upper-Oubangui) at the beginning of the 20th century. In 1910 it became one of four territories of the Federation of Equatorial Africa (AEF). The process of decolonization started in French colonies of Africa during World War II, when General Charles de Gaulle called to fight for free France. After the end of the war numerous reforms were implemented in CAR, for instance, all inhabitants were granted French citizenship and they were allowed to establish local assemblies. In September 1958 AEF was dissolved. 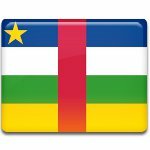 On December 1, 1958 the Assembly declared the birth of autonomous Central African Republic. The anniversary of proclamation of the republic is annually celebrated with military parades. Another traditional activity is a pirogue or dugout canoe racing.